After scoring seven goals and conceding six last time around against Philadelphia, the Toronto Maple Leafs will look for a more complete performance this time around as the Flyers try to avoid official elimination from the playoffs tonight at the Wells Fargo Center (7 p.m EST, Sportsnet). The Leafs 7-6 win against Philly two weeks ago was certainly a far-from-perfect, barn burner of a game, but it was nevertheless a much-needed win for Toronto after two awful performances against Tampa Bay and Chicago in the days leading up to it. The night after, against Ottawa, things went south again and the Philly game ended up being their only win of the week. Winners of just three of their last eight, the Leafs have conceded six (vs. PHI) and five goals (vs. FLA) in two of those wins and they would like to start winning and putting together cleaner 60-minute performances here as the regular season winds down. Brian Elliot was the starter last time around, as Carter Hart had returned the night before in a loss to Washington. Tonight, with both teams rested, Hart — who has now started virtually every game outside of back-to-backs for the last couple of months — will be in between the pipes for the Flyers. He’s now played 27 games on the season and is sporting a sparkling .927 save percentage and a more average ‘goals saved above expected’ mark of -1.2. In the Leafs net, the decision to start Frederik Andersen is raising some eyebrows as the Leafs are now in a spot where home-ice is out of reach and they’re not at any risk of dropping out of third in the division — the same position as last year. Alternating starts with Garret Sparks the rest of the way makes sense from a rest perspective, although ultimately, these decisions come down to the goalie and the goalie coach as far as how Andersen is feeling about his game and where his energy level is at, mentally and physically. 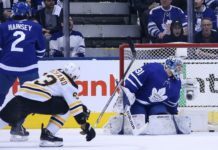 The Leafs want Andersen at his best performance-wise come Game 1 vs. Boston and he’s currently working through a six-game stretch where he’s posted a .841 save percentage, so there is that balance of getting Andersen to emerge from the funk while ensuring he’s fresh for the postseason. Last time we raced them to ten and we’d like not to do that again. It’s a good opportunity for our team playing real high-end offensive players. They’ve got a real active back-end. Their top six is as good as anybody, so they make it hard on you that way, but it should be a lot of fun. Their power play is good [too]. We have to be disciplined. He’s done a good job. We’ve used him a bit in the past but obviously not regularly. It’s just part of evolving [his] game. You arrive in the league as a young player — you play regular strength and then the powerplay. Now that he’s mastered that, he’s moved on. He’s a real good player for us. He plays well defensively 5-on-5. Real good without the puck, and obviously, real good with the puck. He gets a ton of his offence out of his defense, and the same on the penalty kill. Well, the biggest thing is you want to walk into the playoffs with swagger, feeling real good about yourself. There’s two parts to that — the part the team can do to help him, but it’s also what you can do. As a goalie, you’ve got to be feeling good — that’s working with your goalie coach, taking the right amount of time off, getting a rhythm. The biggest thing is you’ve got to feel good. Any athlete that can pretend they’re playing good when they’re not feeling good — it’s just not possible. What’s the proper amount of time off? Well, that’s why I’ve got a goalie coach and Freddy. We talked about that yesterday. We talked about the plan. You know, Fred’s not 12 — he’s a man, and so we went through it with him. ‘What do you want, what do you need, and what are we going to do to help you?’.